By Craig | April 3, 2019 | This post may contain affiliate links, which means we may receive a small commission, at no cost to you, if you make a purchase through a link. Read our Disclosure. Living in Dublin for a year back in 2003 is one of our favorite travel memories. Being able to spend so long in Dublin gave us a great chance to get to know it and learn about the things to do through the eyes of a local. It’s no secret the Irish are known for their hospitality and the love of a pint of the black stuff, Guinness. Many nights we spent in a cozy traditional Irish pub built of character, and filled with live music whilst digging into a hearty meal. There are SO many pubs in Dublin, but our list showcasing 10 of the best Dublin pubs and bars is a good place to start. One pub we forgot to mention on that list which is a locals favorite is The Stag’s Head. Whilst Ireland is famous for having one of the best pub scenes in the world, that’s not all it’s got going for it. It also has spectacular coastal and countryside scenery, charming towns, historic castles, friendly people, and lots of interesting history. Most visitors arrive and exit out of Dublin, and we recommend you spend a few days walking around and getting to now this city. It’s not a big city by world standards, but it’s big on energy, history, and atmosphere. A Victorian park that is free to enter on the South side of the city, and is one of those relaxing things to do in Dublin. It is the largest of the Georgian Square parks. It was one of my favorite places in Dublin to sit and relax, watch the world go by, and have a beautiful picnic lunch. You will find it popular with visiting tourists, students, and workers taking a break from a busy day at the office. Is the largest Georgian square in Dublin. Take a leisurely stroll around this park and admire the red brick townhouses with their colorful doors and check out the monuments including one to Oscar Wilde. Located right in the center of Dublin, it’s Ireland’s oldest University and most well known. The cobbled stones of Trinity College will transport you to the 18th century when the magnificent old Library Building was constructed. And you can see the famous Book of Kells, a ninth century gospel manuscript famous throughout the world. Ireland is not just known for its black ale and leprechauns , but for the incredible literary talent. One way to learn more about these literary geniuses is by doing a Literary Pub Crawl through the streets of Dublin, visiting these author’s old writing and drinking haunts. Two actors take you on a tour through the maze of narrow streets into several pubs where they act out scenes from the work of Joyce, Behan, Beckett, Yeats, Oscar Wilde and more. Grafton street is on the South side of the Liffey and is high end street for shopping. If you don’t have the money to spend in boutique and departments stores such as Brown Thomas, you can window shop as you walk amongst the crowds along the cobble stoned street, people gazing and watching the ever-present buskers that line the streets. I love the atmosphere on Grafton St.
An hour south of Dublin is a scenic drive that takes you through Glendalough and the Wicklow mountains to an impressive lake set in the valleys. 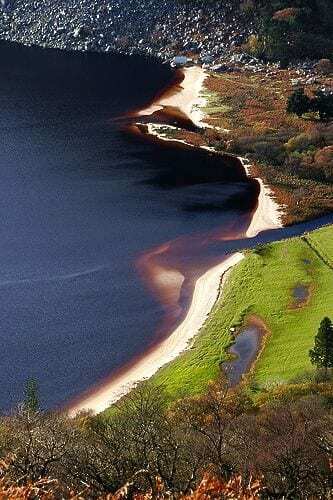 Guinness Lake is aptly named for its dark color, and with its white sand sitting at the top makes it look like a foaming pint of Ireland’s finest. I have heard it is named for the Guinness family whose property surrounds the area, but I like the other reason better. One of the largest city parks in the world and is a place to get away from it all. This park has lots of green space, monuments, and plenty of benches to rest on after taking a leisurely stroll. Free to enter. No trip to Ireland would be complete without a visit to the Guinness factory. 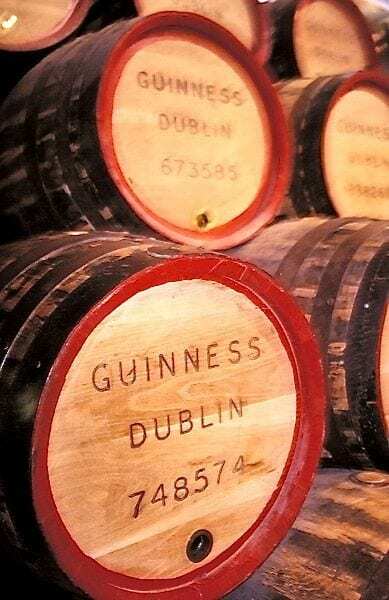 It is not just a pint of Guinness that comes with the entry fee, that is worth the visit, the museum gives a fascinating insight to the history of Ireland’s favorite drink, how it is made and the influence it has over the world. You won’t taste a better pint than the one poured here, and the bar atop the factory has huge wrap around glass windows offering the best views over the Dublin city skyline. Dublin has many great outer suburbs that are worth visiting for a taste of local living. Our favorite was of course our student village, Rathmines, that was full of great bars and Irish pubs. Donnybrook and Ballbridge are two of the more affluent suburbs in the South of Dublin, and are worth a leisurely stroll to see some of Ireland’s finest Victorian architecture. Shrewsbury Road in Ballsbridge is the 6th most expensive road in the world. Dalkey and Killiney is where you may run in to celebrities such as Bono and Enya, who have homes in these upmarket neighborhood’s by the sea. You can reach these towns by the DART, the Dublin Area Rapid Transit (train service). And Howth is a small fishing village popular for the climbing of the 171m high hill on Howth head, is located an easy train ride to the south of Dublin. Whilst there is an actual “Temple Bar”, the name really refers to the “Temple Bar District” which is basically one main thoroughfare of pubs and clubs. If you must visit this very touristy area, the best pubs are “Quays Bar” for live music and the Porter House. 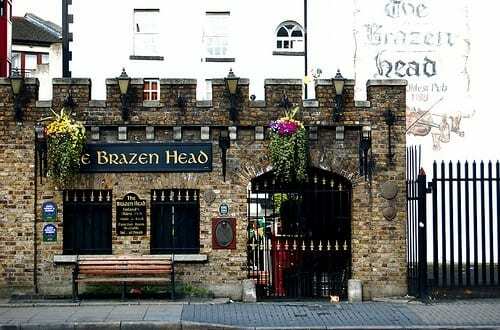 And be sure to have a pint at Ireland’s oldest pub “The Brazen Head“, just on the outskirts of the district. Dublin is a great walking city. It’s flat, relatively compact, with lots of interesting things around each corner. Wander down O’Connell street, one of the widest in Europe, and see the main Dublin Post office, the Spire, and other statues. Also Dublin Castle, Christchurch Cathedral and the Temple Bar District is easily accessible. The best way to see Ireland, and the way we did it, is to self-drive. It’s not a big country, and navigating the roads and towns is relatively easy, although signage is not the best in the world by anyone’s standards. Head north and visit Belfast and do a black cab tour. It will give you an up close and very personal look at the history of Ireland’s struggles and the incredible painted murals. Belfast is much less touristy than Dublin and has a nice Botanical Garden. And take a tour of the impressive City Hall. Check out the Giants Causeway and the rugged Antrim Coast which has views all the way to Scotland on a clear day, before heading south-west to Donegal. One of our favorite towns on the west coast was Doolin, a small town with charm and a great live music scene in some of the coziest of Irish pubs. And close by are the famous Cliffs of Moher. Galway is a fun town with a great vibe and being a university town has a great student atmosphere. It’s a a slower pace than Dublin but big enough to keep you entertained for a day or two. It’s also very walkable and has a nice central square and provides for easy access to the Connemara. A highlight of our road trip was The Connemara Loop which had incredible rugged scenery and is not to be missed. 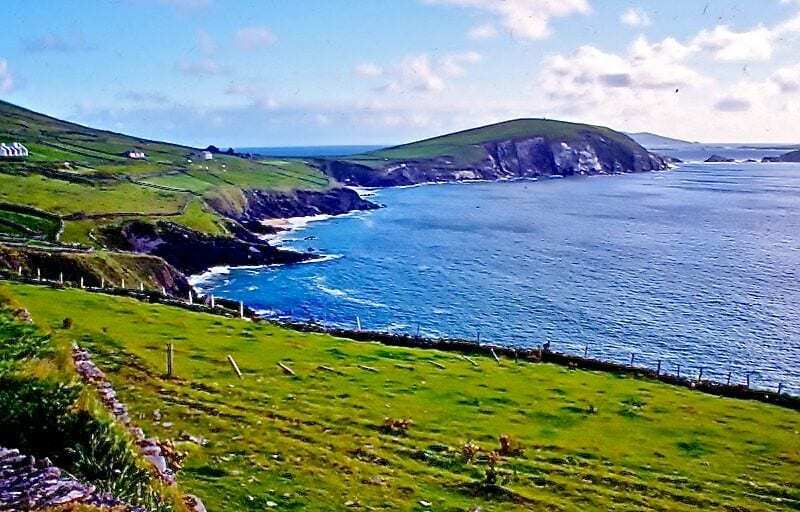 Other scenic highlights for a road trip is the Ring of Kerry and The Dingle Peninsula. We actually preferred the Dingle Peninsula over it’s more famous counterpart, but if you have the time drive both. And the town of Dingle is wonderful set right by the ocean with cozy pubs and great food. The West Cork region and Mizen Head also provided for more of Ireland’s spectacular famous scenery. And the city of Cork is also worth a day or two as an alternative experience to Dublin and Galway. Heading back up the east coast we found Kinsale a charming little fishing town by the sea with classic Irish pubs and eating options to die for. Further up the town of Kilkenny is worth a visit. Go check out the well known Kilkenny Castle and enjoy a pint of Kilkenny, our favorite of all the Irish beers and one of our top three in the world. Ireland is almost as well known for it’s castles as it is for it’s pub culture. Some of our favorite’s were Kylemore Abbey on the west coast, Dublin Castle, Malahide Castle, and of course the famous Blarney Castle. No trip to Ireland is complete and you won’t get a better understanding of the Irish culture unless you spend some time in their pubs. Going to Ireland and not drinking a pint in a pub is like going to Sydney and not seeing the Opera House. Ireland has a pub on almost every street corner and one in between. Back in Dublin see our post on 10 of the best Dublin pubs and bars for some ideas, or just find a pub in whatever street or town you are in and enjoy the craic. The stadium was a sea of brightly colored orange and green jerseys, and the team flags madly waving in the crowd were incredible. The atmosphere was electric with fans screaming and cheering with every play of the ball. It was a great cultural sporting experience and highly recommended if you get the opportunity. When we lived in Dublin we were meat eaters. Not too sure how we’d go now being vegetarians, but Irish food is delicious and hearty. Some of our favorites were potato and leek soup, bacon and cabbage, Guinness or Irish stew, and of course potato. Each dish you order will come with three varieties – mashed, baked, and boiled. The Irish don’t want you forgetting about those famine years. Michael Figueiredo – The most obvious thing is go to the Guinness Brewery and have a pint, overlooking the city. Michelle Lara – Definitely the Cliffs of Moher, the Blarney Castle, and Killarney Lake. Earl Winston Squirrelson – Yeh the Guinness brewery is awesome, I did a sham rocker tour of southern Ireland, loved everything I saw and did. I would say you must talk to as many locals as possible, they rock! Don’t kiss the Blarney stone, people pee on it! Definitely go to the west coast and see the cliffs of Mohr. Lauren Fritsky – Bunratty Castle for a feast and a show. ToursByLocals.com – I wouldn’t normally advocate hitchhiking, but my sister and I did this all around south and West Ireland and met so many wonderful people. Especially loved walking through the Gap of Dunloe, near Killarney. With the soft golden light, tumbling stone ruins and green fields, it really felt like a leprechaun could jump out at any moment. Beers and Beans – Before you have the pint at the Guinness factory, make sure you buy the dark Guinness Chocolate bar in the gift store. Then go up, have your pint and eat the chocolate – most amazing flavors ever. Travis Ball – My Suggestions (in no order): Cliffs of Moher, Blarney Stone, Giant’s Causeway, Murals in Derry and Belfast, Guinness Brewery, and hit up a pub in each and every city you stop in along the way for music and conversation. 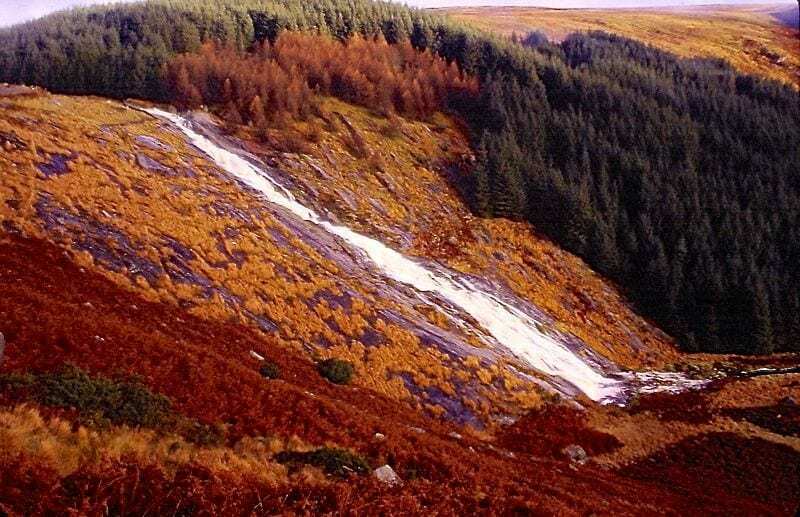 Catherine Sweeney – All of the above, plus: Rock of Cashel, Newgrange, Mizen Head (Cork coast), Connemara, stay in a farmhouse at least a couple of nights, & don’t spend too much time in Dublin — get out into the rest of the country. Booking.com has 3,266 properties in Ireland from hotels to apartments to hostels. You get free cancellation on most rooms and a best price guarantee. Hey thanks for this awesome list! I think this would make for a grand trip to Ireland. Ireland has been on the list for way too long and needs to be moved up quickly. Very informative post. Ireland is one of our favorite destinations for sure. The people, the scenery and the atmosphere is all great. Glad you like the tips and hope you get to move it up the list real soon. Holy awesome-sauce!! This will be a great resource for us. We get to spend a few days in Dublin before we venture out to County Meath. That Guinness stew looks delicious. Cheers! You will have an awesome time in Dublin and your other destinations. Jealous actually, after writing that post it brings back so many great memories. Enjoy. That sounds absolutely wonderful. Too bad about the blarney stone being peed on. I have to absolutely plan a trip to Ireland. Love the pictures too. I loved Ireland but I wish I had known about the literary pub crawl when I was there. That sounds like so much fun! I recommend Gallagher’s Boxty House in Temple Bar for some delicious boxty. Great list, I’m sure many will benefit from it! Wow great pictures! I was there a year ago (cycling tour around Cork) and this makes want to go back and see more of Ireland! Ireland looks absolutely gorgeous! This is a place i will have to visit next time i go to europe. Help!! i want to plan a trip to Ireland, the only thing i know is that i will fly into Dublin. I have 10 days and i want to see castles, moher cliffs , fishing villages , pubs etc… the typical im sure. I think i would like to stay in B&B’s and for sure a night in a castle and maybe a cottage. It will be a self guide trip. Does anyone know where i should start and average cost of a ten day trip? Is anyone going to comment here? 😀 This person could be us!!! Although we have been there already it was too short and we spent too much time in the car! Now we are going back for 11 days THERE and bringing good friends! This person asked all the questions we have in our heads!!! I think we ll go the Dublin to the west route this time…. We ll check back soon!!! Love your blog and site!!!! Thanks much!!!! My closest friend and I will be traveling to Ireland in Sept, it was not on my bucket list to see, but flights into Dublin were the cheapest. By far much cheaper than flying into Italy. We decided to say a week there and explore the Emerald Isle, now I’m very excited to see the Isle. We are staying in one castle and B & B’s along the way. Just a little nervous about driving on the wrong side of the road, but that too will be part of the adventure. As a chef I am hoping to dine where the local dine, I know how to cook fancy foods, and don’t really want to eat it. I love good home cooking, eating in dives and tasting the real foods of countries. So where to? You will have such an amazing time Juanita. Ireland is so beautiful. Don’t worry about the driving, you’ll get used to it quite quickly. Just take your time with it. The roads aren’t too busy over there either. Yes those 3 cities are the largest in Ireland so have good bus or train connections. It’s all linked by motorway now so travel times have been dramatically reduced as well. There is a bus company called Citylink who cover all 3 destinations. I loved all 3 cities, but Cork is special. Check out the pub An Bodhran Bar 42 Oliver Plunkett Street, Cork. It’s amazing for craic and live music. Also, if you like beer, the Franciscan Well brewery / pub on North Mall. Wonderful! Without a doubt! Although I’m vegetarian now, but boy did I love a good Irish stew! I loved Galway when I was there. By pure coincidence, I arrived just as Galway Arts Festival was beginning – awesome with music concerts lunchtime and evening, buskers, art and photograph galleries, street parade and a whole lot more. but (the Burren) not mentioned in your article. Lovely country, Ireland. The photos online of the Burren do not do it justice. I am so happy to have gone. 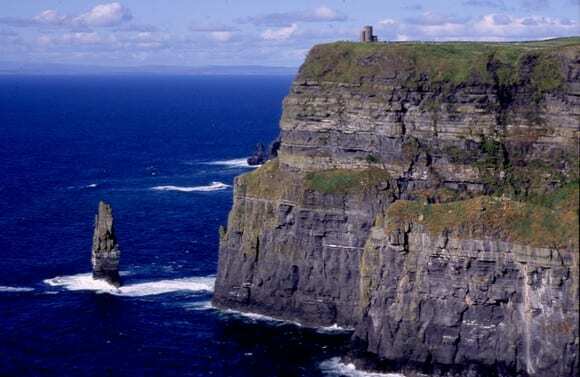 Galway Tours has a great day trip from Galway City to the Cliffs of Moher for 25 euros. It goes through the Burren and lunches in Doolin. I highly recommend it. I’m pretty sure it’s the one Jon Dunn references. OOPS. I didn’t notice how old this thread is. Sorry. I can’t believe no one’s said the Aran Islands!! It was gorgeous and interesting and it is SO old!! It’s a must-see! I wanted SO much to go, alas we were there in November and the weather was more than a bit blustery! There were wind advisories throughout our trip, and we were unable to make the ferry ride out. I will definitely do it next time over, though! Does anyone know about Vagabond Tours in Ireland? Not familiar with them Ann. Maybe have a look on Trip Advisor for any reviews. Hi! I am trying to plan a trip to Ireland with my sister. We were thinking about going in March for St. Patricks day, Would March be a good time to go? I know it is not as warm as the summer and probably not as touristy, but we want to experience the real traditional Ireland whether and St. Patricks day. Do you recomend this as a good time to travel there? Sure! 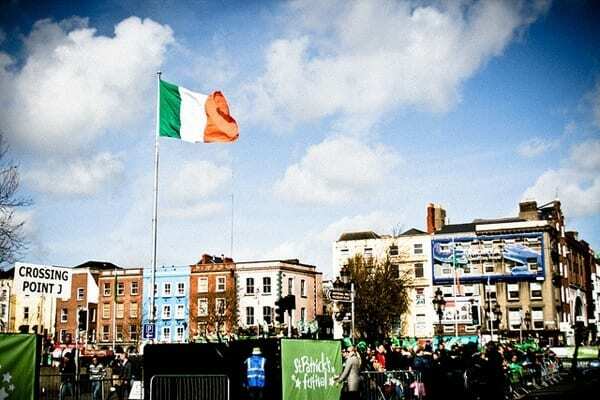 PAddy’s Day is awesome in Ireland. Just plan ahead for the dates around March 17 as it will be busy and things will be booked. It doesn’t matter too much about the weather in Ireland is its generally always wet and cold!! Just found your blog via Pinterest. Such great info. Question: where are the best places to stay for lodging? We would love to stay in a b&b or a hostel. The goal is to stay in Dublin but hopefully travel out and around the island. We aren’t going until next summer and it will be just my daughter and I (so I don’t want to stay in a dangerous area). Thank you! I had the pleasure of going to Ireland, three times ,each time was a delight. I would certainly recommend the country to anyone. you must see Dun Aengus on Inishmore, one of the Aran Islands! Better than the Cliffs of Moher! Cold and wet are most days. I learned quickly to not wear jeans that drag or touch the ground…the water wicks up quickly and it is miserable! As for dress, leggings and skinny jeans are common. Do dress in layers, take an umbrella or rainjacket and a scarf. Also a crossbody purse is a must, and guys should carry wallets and phones in front pockets. Enjoy your adventure!!! Ireland really is magical! I had no desire to see the Burren, until I was there. Oh! My! It is so beautiful and rugged. The photos online do it NO justice. I highly recommend the Galway Tour Company’s day tour to the Cliffs of Moher from Galway City. It is inexpensive and AMAZING, and takes you through the Burren and stops for lunch in Doolin for lunch. A fabulous day that gets you back to Galway City in time for dinner and an evening in Galway. If you have the time, go to Donegal. Slieve League cliffs are amazing as is Glenveagh Castle and National Park. The Inishowen Penninsula is beautiful with Malin Head and some ancient fort sites. Horn Head is also gorgeous as is the whole coast, really. Very charming towns that don’t see many tourists, so we were practically celebrities in the pubs! Lol. It really is worth the drive and so few people go. Thanks for your tips Jen. Can’t wait to go back to Ireland, with our kids this time! Great blog! Do you have anything on Limerick? Ireland is the ultimate road trip! If it’s not on your bucket list, than it should be! To read more about my recommended stops, check out my blog!